The dorsal root consists of axons bringing data into the spinal cord, like those that signal the unexpected entry of a tack within your foot. The ventral root is created of motor nerve fibers. The cytons of motor neurons lie inside the ventro-lateral horn of gray metter. Their axons create the motor nerve fibers that arise from the spinal cord in the ventral root of spinal nerve. These go into the glands and muscles inside the peripheral tissue. Some ventral roots fibers reach the skeletal muscles precisely that are somatic motor fibers whereas others travel towards the autonomic ganglia as well as terminate there. 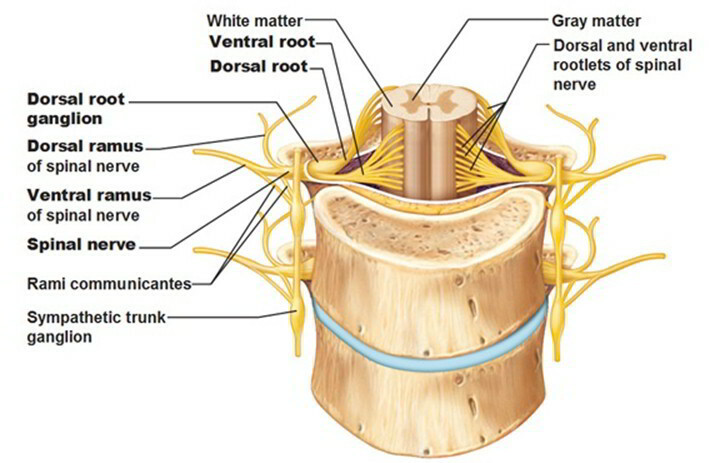 The two roots combine inside the vertebral column creating the spinal nerve. So all spinal nerves are mixed up in nature and are primarily created of medullated nerve fibers. These run in between the spinal nerve and the peripheral tissues. The ventral root consists of axons bring data far from the spinal cord for instance, to the muscles that jerk your foot away in action to the pain of the thumbtack. The ventral root brings motor axons emerging from the gray matter of the ventral spinal cord. The butterfly shaped core of the spinal cord is gray matter including neuronal cell bodies. The gray matter is divided within the dorsal, lateral, and ventral horns. The arrangement of gray along with white matter inside the spinal cord varies from that in the forebrain. In the forebrain, the gray matter envelops the white matter; in the spinal cord, it is vice versa. The thick shell of white matter, consisting of the long axons which travel up and down the cord, is split into three columns: the dorsal columns, the lateral columns, as well as the ventral columns.